Went to pick up the Christmas tree today, two actually , one for us & one for our daughter & we passed this scene on our way to drop theirs off at their house . 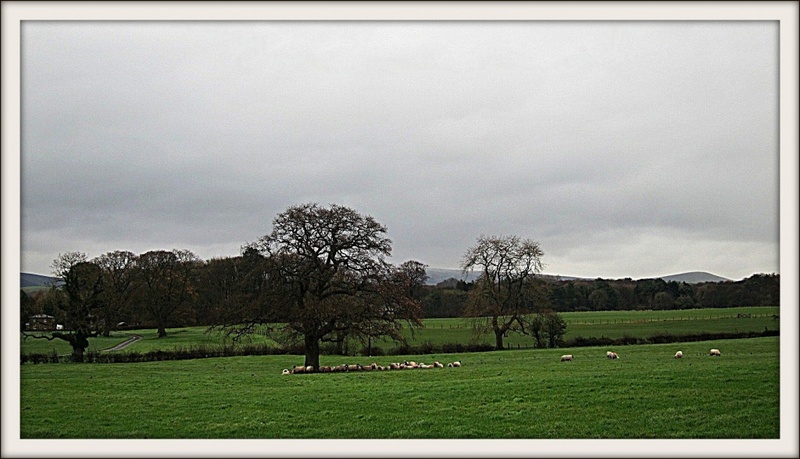 I made Harry stop the car & took this photo of these sheep all sitting under this large tree. It is a cold windy day here & I felt sorry for them! We are out tonight so won't be doing any commenting I'm afraid til tomorrow. We have to brave the wind & rain on the sea front at Blackpool for a farmers dinner dance... I think it might be a black trouser night !!! i'm sure they keep eachother warm .....great shot & have fun !!! The grass is so green! Great shot Pat...worth the sudden stop! @jquinn @shutterbugger Thank you both for your comments !!! @phil_howcroft Thank you Phil on all counts & I like your word format for these comments ..easy to read !! It must be a very likable tree, who could disagree with that many sheep. Phil's right - very lovely indeed Pat. It's all go on the social front for you farmers isn't it!! The problem with working for ourselves is that we don't get a 'works do'. Mind you Nigel is going to a client's one in London (I'm not invited!). @robinwarner @sabresun Thank you very much both of you !! @judithg I must admit we do like a bit of social us farmers & it will be a very late night, not so bad for us but it used to be a killer when we were milking !!! Out twice more this week too !!! so crisp and clear - must be magnified for full appreciation. btw, I LOVE black trousers! have fun. I'm sure sticking together would be a wise idea in this weather! All these woolly coats together should keep every one cosy! @karenann Yes, so you are keeping it ..good ! You will look terrific in it !! @stepheesue Yes have got the black trousers on , they are more like silky harem pants & I love them, wear them a lot with different tops !! @sarah19 At least there is no snow but a vicious little wind !!! Going to brave the front at Blackpool very soon ..brrr. The hotel is right on the front & we usually have to park miles away !! A greener winter scene than ours at the moment. Do we have to look out for you in the Strictly audience at the tower on Saturday? Poor sheep - have they recently been shorn? Hope at least, that they have their warm woolly coats to keep them snug. I hope your night out was fun - to make up for dragging yourselves out in the cold, wet weather. I think the sheep have the right idea! lovely fresh green colour grass, hope you have a great time! Snap we got our Christmas tree today , I also took a photo from the farm we got it from. those sheep are going to need their woody coats tonight. hope you enjoy your evening. @jmj I did apply Jennifer online & would have loved to have gone but no luck !! We are going to see Alfie Bow instead he is on at the Opera House !! I am sure Blackpool will be buzzing that night with lots of people milling around the Tower, might go & have a look ourselves !! A very nice scene, and I hope you have a wonderful night. Enjoy. Great bucolic scene...and you sound busy! how picture perfect is this. Sounds like you are going to have a great night out. great shot - the sheep obviously know there is going to be a change in the weather!